Summary: In our second episode, Jen discusses the joys of knitting with Savanah. The conversation starts off predictably enough, exploring new motherhood and knitting as meditation. But before long, Savanah gets into the nitty gritty of competitive adult gymnastics. From the transcript below: I’d like to tell you a little bit about something I made this week. I traveled down to Martha’s Vineyard for a bridal shower and wanted to bring something special and useful for the bride-to-be. I found some beautiful and hearty recycled denim yarn at my local craft shop and knit up three washcloths. The pattern, while simple, creates a piece that is eye-catching and appealing. They should be resilient enough to withstand dishwashing but are delicate enough to be displayed. I love this pattern and will definitely go back to it for future gifts. You can find a link to the pattern in the show notes. Hello. Welcome to “How to Make a Memory,” the show that explores the items we make for one another and how they impact our relationships. My name is Jen Tierney and this week we’re going to be talking with my friend Savannah. Several years ago, Savannah and I had gone with a group of friends up on a skiing trip in Vermont and while you were there one afternoon there were a number of people who expressed some interest in learning how to knit. Being up in Vermont, on a cold afternoon, they felt moved to take up the hobby. So, as a knitting instructor, I sat down with them and spent a few hours going over some of the basics. It really gave me a chance to get to know Savannah better and we’ve been pretty close since then. So, when she heard that I was doing this podcast she really wanted to talk to me about how her life has been impacted by the inclusion of knitting as a hobby and as something that allows her to create things for the people that she loves. So we sat down and had a chat about that. I hope you enjoy listening to our conversation. Jen: Thank you so much for agreeing to come and chat with me for a little bit. Savanah: Thanks for having me. Jen: So tell everyone a little bit about your wonderful self! Savanah: Oh man, well, my wonderful self was born into kind of a weird family situation. I was raised in the Navy with – it was just me and my mom – and we moved around every three years. So I had kind of an uprooting and pretty diverse upbringing and ultimately I ended up going to high school in New Jersey. So usually people can relate to that. I don’t really like to say I’m from New Jersey because it doesn’t seem accurate. I ended up in Boston for school, or the Boston area should say, and met my now husband and recently became a mother. So I have an almost three month-old upstairs. I think she might almost be asleep but if you hear some baby noises, it’s probably just her. Jen: I am very very very glad that you have even given me any of your time considering that you have such a tiny little baby. As a mom of two, I know how difficult it is to find time to do anything other than like, try to sleep, try to shower, and feed your baby. Constantly. Jen: They eat a whole lot for little tiny people! So tell me a little bit about what it is that you make and why it’s so important to you. Savanah: I like to consider myself a little bit of a beginner in the – instead of calling it making I’ll call it crafting since that’s like a trendy word now right now. Just a few years ago actually I met this lovely woman who was stuck with me in, what was it Vermont? Jen: [Laughter] Oh, I wouldn’t call it stuck! So I like to knit but I am still I think a little bit of a beginner in the knitting world. But that doesn’t mean that I haven’t made some things and really enjoyed. Jen: Some very impressive things, I would say. I would not categorize you as a beginner but I mean you feel free to be modest if you’d like! Jen: So, I haven’t talked about knitting yet on the podcast but I’ve been knitting for fifteen or sixteen years and for me, I also got into it because I was looking for a mindless activity. But I’ve found over time that it is the exact opposite. It’s a very mindful activity. What it’s enabled me to do over time, and I’m sure you’ll find this too, is I can sit and do something that is mindless like consuming television or a podcast – something that really is very passive – while my brain is very engaged in knitting. And I have to be very mindful of what I’m doing so that I don’t drop stitches or make mistakes or whatever. But I’ve found that over time my brain can now juggle those two things, which initially for most people is very impossible. For me it was completely impossible until maybe six or seven years ago. So… Oh I’m so glad you’re talking about knitting! I love knitting! Savanah: Oh but anyway, as I was saying, that knitting has just become a really enriching thing. I think making things for other people and also for myself has been something that I’ve never really been able to do before outside of the random scrapbook. Not to belittle scrapbooking. I know some people who are very very good at that. But outside of the typical project or like things I did in elementary school for my mom, like create a little necklace. It’s been really really great to kind of explore my own abilities and, you know, depending on who I’m making it for the amount of detail or the amount of not-detail that goes into the project. Savanah: Yeah. Who is it for? Is it worth ripping out, you know, 12 rows so that I can go back and fix that one knit stitch that’s a purl? Jen: And the level of difficulty of the pattern you pick. There have been people in my life who I really want to make something special for but I know that they’re not going to appreciate really detailed and – like 80 hours worth of work is not going to – it’s gonna be lost on them. So pick a pattern that’s gonna take me 10 hours, you know? And like that’s still a big commitment. That’s still a really huge gift for someone, I think. If somebody spent ten hours making something for me I’d be like, “Ten hours of your life?” So, I still feel like it’s meaningful, but I haven’t created something that they won’t necessarily appreciate the way somebody else would. And I can spend that time making something for someone who maybe is a knitter or does do crafting and will kind of accept it with that level of enthusiasm. Jen: So tell me a little bit about some of the things that you’ve made? its simplicity, (because the person that I was making it for would not appreciate it yet) is I made a baby blanket for my child. Also, I think part of the reason why I chose a simple pattern was because I very wisely knew that I would be pregnant when making this blanket. Jen: Yes! It’s good to think ahead. Savanah: There were so many nights where I was like, “I really should finish this and I know it’s a really good goal to have.” And I’m really glad I did it. It really is good to have something to make and create and watch grow as you are growing a child. But, man, when I made a mistake I was not going back to fix it. Jen: Mm-hmm! Yeah, there’s something about being pregnant that makes knitting sort of like, “Oh hell no! I’m not gunna fix that! Whatever, I’m doing something really hard right now! I’m not going back for that! Savanah: It’s still enjoyable, but it’s really only the muscle memory part that is fun. At least for me, anyway. When I was pregnant I did not go back and fix any mistakes. But I guess there are other projects where I’ve sort of, to your point, wanted to give something to somebody who would appreciate it. I think the example that I’m thinking of is more… I really wanted to impress the person that I was making it for. Then, I’ve painstakingly gone back and tried to fix things. The best part about knitting is feeling like you will never figure it out, and then figuring it out. For people who don’t knit, I feel like it’s just, “I mean it’s just two needles and yarn, like what’s the big deal?” But no, no! This is fixing a problem! It’s really rewarding and very challenging, at least for me still. Jen: Oh yeah, I still come across things that… because, I mean, I teach knitting now and I have students that come in and I take a look at something they’ve made and I’m like, “I have no idea how to advise you on this because I have no idea what you did. Please hand it to me.” I’m very fortunate in that my brain – because of how much I have knit over the years – my brain can look at the knitting, just kind of see the tangle, and understand how to undo it. But if I had to explain it to another human being in a way that they could replicate? Sometimes knitting problems are so unique that there’s no way that I could be like, “Let me explain this problem to you so you could fix this again when it happens in the future.” Cuz it probably will never happen that way ever again. Savanah: Well, it’s like a network or maybe a language. I don’t know what a better comparison is but it’s really complex. Looking at all the different stitches and how they interact with one another and how the pattern’s supposed to look. It’s tough but that’s why I like it so much. So I’ve really appreciated learning it. Jen: Tell me more about this lovely blanket! And you’ll have to send me a picture too, so I can include it in the show notes. Savanah: I think the reason – Have I showed you a picture yet of it? Jen: No! I haven’t seen it. Savanah: Probably because there’s so many mistakes. Jen: That’s okay! Take a picture of a spot that doesn’t have any mistakes. It’ll just be a close-up of the blanket, it’s fine! Savanah: No this blanket… you might have been able to pick up on this already, because of the way that I’ve been talking about it. I’m pregnant and I’m knitting, and at this point I think I was like 37 weeks. Almost finished with it. Almost finished growing this baby. And it doesn’t really matter, but I needed to finish this blanket before the baby was born. So I’m kind of rushing through it and I have the baby and it’s amazing and it’s great… but I had her in May. So Spring, and Summer around the corner and also I just I didn’t really have much use for this blanket that I had slaved over. I took some newborn pictures of her. I also like to kind of dabble in photography. I took some some fun newborn pictures of her with her on the on this blanket, but otherwise I just had not gotten any use out of it. I know it’s only been three months but that’s obviously an eternity to me, you know? I’m a little disappointed that I haven’t been able to introduce this blanket to my daughter even though I know she’s not really capable of appreciating it right now. But I recently kind of haphazardly slung it over our rocking chair. I have a rocking chair in the nursery – that’s where I feed her most of the time. And I didn’t think about it when I was doing it. I just needed a place to put it that wasn’t over the crib, because you’re not supposed to put anything over the crib or in the crib. And I started feeding her one night and noticed that she was captivated by something behind me. My daughter’s kind of getting to the age where she needs to really look at things all the time and be stimulated constantly and I just realized it’s because I’ve got this pattern behind me from the blanket. So that was a really fun – really small – but really lovely moment of introducing the blanket to her and not even really intending to. And now she has something to stare at while I’m feeding her or trying to burp her or whatever else I’m doing in that rocking chair for her. And then the other night it got a little bit chilly, finally, here. I live in Colorado and it’s August now but it was late July when this happened and I realized that I was cold and she was cold and getting up to close the window was not convenient for me. And I realized suddenly with such excitement that I could pull the blanket from behind me and wrap it around us both and got to experience this silly little but really precious snuggle moment with my daughter and this blanket that I had made her. It was a very touching, you know, three o’clock in the morning…. Savanah: Yeah so it’s this thing that I made for her that has been giving back to me a little bit in the last couple of weeks. Jen: Is there something that you feel you really want to teach your daughter, your children, other people, to make? Savanah: It’s so funny that you ask me that because I almost asks you whether or not you wanted to teach Emma how to knit and then I remembered that I was not the person supposed to be asking questions. Jen: I mean, you’re totally allowed to. That’s fine. I do not mind. This is a conversation less than an interview. Savanah: Yeah I thought about that recently: whether or not she’d want to learn how to knit and kind of imagining myself as a master knitter at that point in my life because it had been however many years. But yeah, I would love to just think about teaching her knitting but also explore different ways of making things. I’d love to get the chance to understand weaving and maybe I’ll like dabble in crocheting. It’s an interesting question. I think so much is left up to… you’ve probably felt this many times too, but I have no idea what my child will be interested in. And to think about expecting her to want to do something I like to do is… you know kind of totally outside of my – I can’t even think about it. One day at a time. Savanah: Yeah, I can imagine, if I think about how I was as a kid, I can imagine learning how to knit and then it’s too hard and so forgetting. And then going back and learning again, trying again and ultimately, finally getting to the point where I’m mature enough to persist at the activity long enough to really get to know and enjoy it and also feel ownership over it. Which I think is more of a mature feeling anyway. But yeah, I think whether or not it’s knitting, I think I do really want my daughter to feel like she can create things. I think it’s a really important skill and whatever it is… you know, I used to draw when I was kid. I don’t really do that anymore but that was my kid creation thing. I considered myself very good at art when I was nine, that was my talent. And then I started gymnastics and it took over my life. Jen: I’ve known you for several years and whenever you say to me, “I’m going to the gym to do gymnastics.” I think to myself, “What does that mean? What is she doing? Is she doing tumbling? Is she doing back handsprings? Is she on a horse? What is she doing?” I cannot picture you doing gymnastics. It’s fascinating to me because I know it’s something that you care a lot about and I know it’s something that you’re good at and that it has made you really fit and powerful. As a small person like me – we’re both petite women – and you are so much stronger and more powerful than I am. So I know that whatever this is is really good for you. But I have no concept of what it is that you do when you go there. Savanah: Well, all of these things unfortunately need to be put in the past tense because I just spent the last year making a baby. [Laughter] Would you like me to talk to you about what goes on in a gymnastics gym? Jen: I would love to know what goes on! Jen: How athletic it is! Jen: That’s fantastic! I’m sure you were still impressive. Savanah: Oh, I would say really mixed. We had maybe four really talented gymnasts in our group. That does not include me. I’m not being modest, really. We had four individuals that I can think of off the top of my head who were just really really good. We relied on their scores. And then there were the rest of us. We would have kind of an occasional shining moment out of every five. To give you some background: to be an all-around gymnast means that you’re competing on all of the events, which is floor – that’s tumbling, which you mentioned before – uneven bars, vaults, and beam. It was rare for one of us to be an all-around gymnast. Most of us had given up on at least one event. I didn’t touch the beam or the vault. So when I went to the gym, I only focused on the floor, which is tumbling, and the uneven bars, which I’ve just always found enjoyable. It was definitely a mixed bag. The first person who goes up is always the worst, for lack of a better way of describing it. So let’s say you’re in it, you’re in the middle of a meet, and your team is going up to compete on an event. Let’s say we were doing uneven bars. The first person who would step up to the bars would be the worst and then the last person would be the best. It was quite a spectrum. The point was that we were having fun. I mean we didn’t come in last. We would go to Nationals every year, which is a national club competition. Savanah: Yeah, super fun! And we didn’t lose, you know? We made it into finals. Most of it was due to the shining moments and the four really good people. Jen: I mean, listen: If you are all like grown women in their late 20s/early 30s competing against college-age girls, well they’re still women but like young women, in their peak of fitness, then good for you if you made it to the finals! That’s incredible! Savanah: Well, I think part of it is also that a lot of the women that were in college were not in their peak of fitness. Peak for gymnasts is 14 through 18. Jen: Huh. That’s really interesting. I mean that definitely makes sense because when you’re younger you have less body weight and so you can sort of throw yourself around a little bit easier. But I also assume that as you get older, your body gets more powerful. You get to be stronger. But I guess that’s probably not true. In relation to your body size, it’s probably the smaller you are the better. Savanah: Yeah, a lot of it is your strength to weight ratio, right? And also I think the level of fearlessness in kids. It’s funny but it’s so true. They will just throw things and they’ll get injured and they’ll heal quickly. That’s part of it too. So much of gymnastics is also physics. How you angle your body as you’re approaching a skill and where you distribute your weight. It’s pretty intense. The adult gymnastics experience is a really fantastic one. The group that I not even competed with but hung out with. The type of people that would come to MIT gym to learn how to do gymnastics as adults – they would have these adult beginner classes going on while we were doing open gym. We’d be using the other stuff or the floor or whatever while another group of adults we’re learning how to do gymnastics and it just made for the most amazingly diverse group of personalities. A lot of people were coming from MIT. It’s amazing to watch people try to learn how to do this very difficult sport as adults. And we’d get some 30-some-things and a couple even older, but not too often. Savanah: It’s a little bit of an unfair advantage though because most of the women, I should say in the gym that I would work out in, who were gymnasts have been doing it for such a long time that there was no period of time where they needed to build up that strength. You just go into the gym, you throw some things, you feel awful the next day, but you can still do everything from muscle memory in general. Jen: We’ve brought it up a few times, talking about knitting and talking about gymnastics. It is amazing how muscle memory works. If you’ve done something many times, it’s like your body just knows how to do it. I played flute when I was in fourth through eighth grade and I picked it up a few weeks ago cuz I found it as I was cleaning stuff up and I was like, “I wonder if I remember how to do this?” and I could still do a scale! Jen: It was crazy. I haven’t picked it up in nearly 20 years, but I could still do a scale. That’s probably all I can do. That’s just incredible that my fingers knew where to go. My brain didn’t. I mean, I’m sure my brain was engaged. People who do neuroscience are like, “Of course your brain was engaged!” But there wasn’t a part of me that said, “I need to now do this with my fingers” consciously. It was completely subconscious. “My fingers are just doing this now.” It was really – I was astounded. And I think that, with knitting that’s something that comes along, that idea of what we think is mindless. Where your brain just kind of does it on autopilot, but allows you to get into that place of ‘flow.’ That place of meditation where you can just do it. Savanah: It’s a totally different part of your brain. And it’s so difficult to engage without the assistance of something like knitting, for me. I’ve tried – I think actually we’ve talked about this before – I’ve tried deliberate meditating and every now and then I’ll kind of go back to it but it’s not as easy for my brain to kind of fall into that place without the assistance of something like knitting. I really enjoyed talking to Savannah about her knitting life. I think that she did a great job of capturing what knitting offers people who participate in it as an activity. Not to mention all the really really cool things I learned about the world of adult gymnastics. I was not expecting that, but it was a really great addition to our conversation, I think. I’d like to tell you a little bit about something I made this week. I traveled down to Martha’s Vineyard for a bridal shower and wanted to bring something special and useful for the bride-to-be. I found some beautiful and hearty recycled denim yarn at my local craft shop and knit up three washcloths. The pattern, while simple, creates a piece that is eye-catching and appealing. They should be resilient enough to withstand dishwashing but are delicate enough to be displayed. 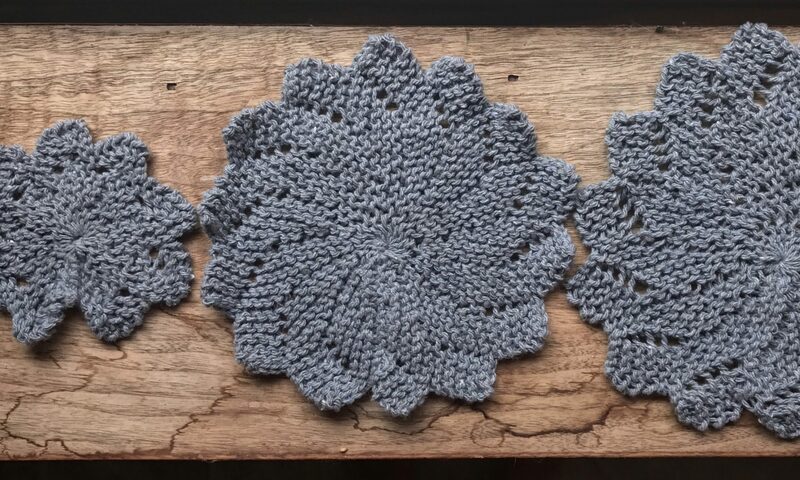 I love this pattern and will definitely go back to it for future gifts. You can find a link to the pattern in the show notes. That brings us to the end of this week’s episode. A special thanks to Savannah for making some time to speak with me in the midst of new motherhood. Our music is by Chuck Salamone. Our logo design is by Becky Carpenter. We get system admin support from Greg Thole. Join us next time for a taste of some remarkably special banana bread. Now, go make something for someone you love. Find How to Make a Memory on iTunes, Google Play, or your favorite podcast app. You can also stream episodes right here on this website. Show notes, including episode transcripts, can be found here as well.